Max is about a marine war dog that goes to the little brother of his handler after he was killed. 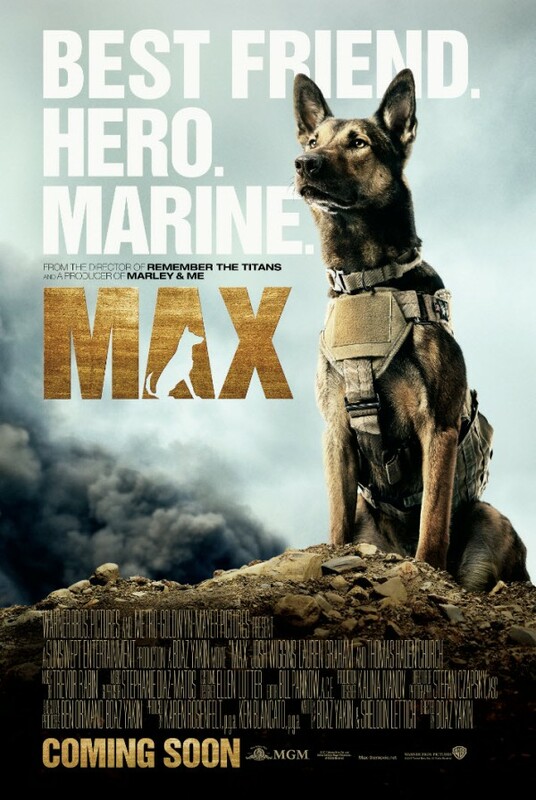 Max was made by the people that made Marley and Me, which almost made me not see it. I don’t handle dogs dying very well. Kill the whole family, just leave the dog alone! Max is probably one of the best dog movies I have ever seen. Yes it is predictable, and because of the age of the kids there are some eye roll moments, but it is still very heart felt and a great watch. I loved the chemistry between Justin and Carmen, even if they are only 15 they made it believable. The one part of this movie I didn’t care for was a character named “Chuy”. Every time Chuy was on the screen he said something that was annoying, and you were supposed to like him! If he wasn’t in this movie it would make no difference. After watching this it makes you want to go home and be closer to your dog, and extreme obedience train him! In the end I would recommend this movie to anyone that wants a great feel good movie.